Democratic House Speaker Nancy Pelosi (CA) made headlines Monday evening when she told The Washington Post that she was against impeaching President Trump unless it was absolutely necessary. For the evening broadcasts of ABC News and NBC News, it was the second topic they covered after yet another deadly crash of a Boeing 737 MAX 8. But CBS News buried it deep in the last few minutes of the broadcast and only gave it a fleeting 17 seconds. Meanwhile, Spanish-language networks Telemundo and Univision ignored Pelosi’s comments altogether. In contrast, CBS dedicated two minutes and five seconds to hyping Vice President Joe Biden possibly joining the Democratic Party’s large 2020 field, and the Democratic National Committee selecting Milwaukee, Wisconsin to have their convention. 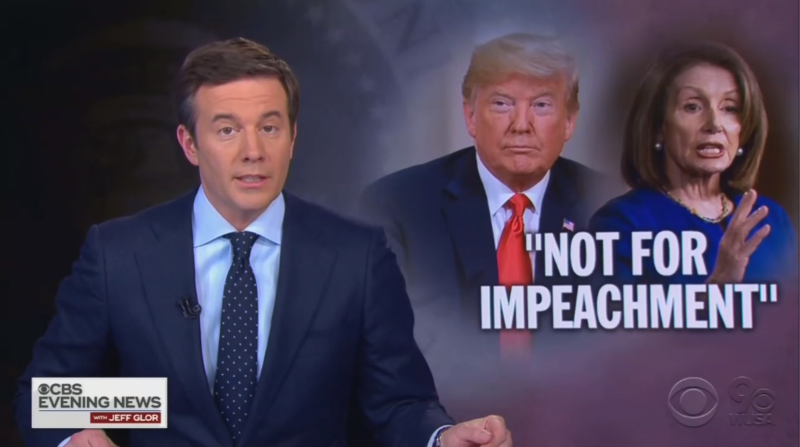 On NBC Nightly News, they framed Pelosi’s stance as something that could cause strife within the Democratic caucus in the House.